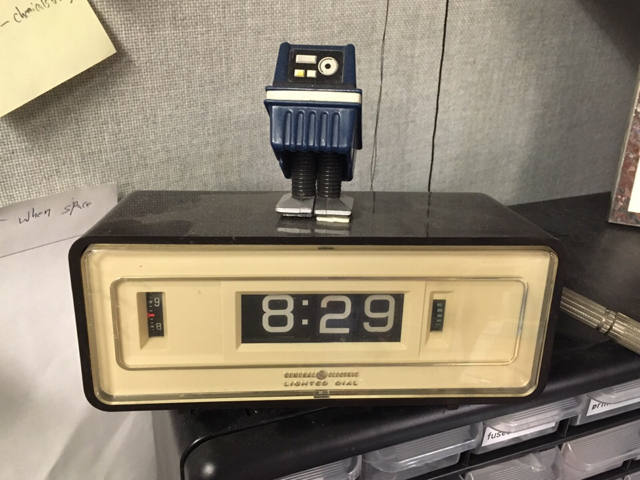 My vintage GE desk clock. The wall clock at a local coffee shop. HerrNano and signum8 like this. 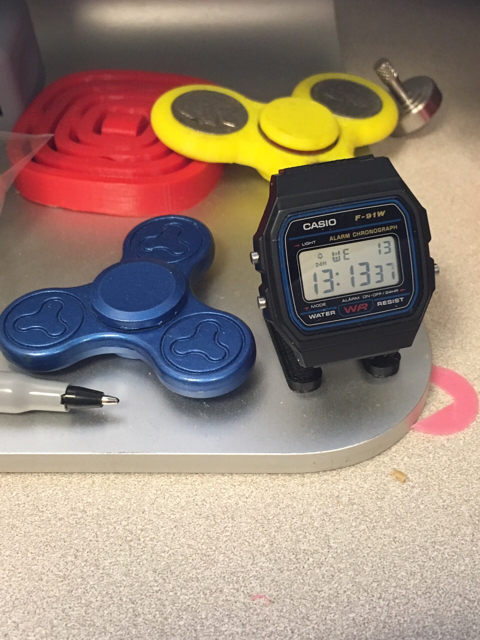 F-91W desk clock with 3D printed parts. I found a Bulova in a back office at work. It really made me chuckle. If you never believe in anything, you'll never be disappointed. I made this over 30 years ago; the plans came from a book "Make Your Own Working Paper Clock". I hacked the design quite a bit; the paper is much thicker than that supplied in the book, the power spool is about 1/3 the design size and made of a paper tube over a wooden dowel with a coil spring as the ratchet. I did this to increase the reserve to almost an entire day so it would still be running when I returned to work the following morning. I had to up the weight to compensate for the smaller spool; what you see is a lead chip from planing block of lead on a planer (they were taking about 1/2 inch off at a time). I also hard faced all the gears and pivot points with crazy glue (model aircraft type). The black lines running down the sides are tuner string for old school radio tuners where you crank and the pointer goes across; I needed to gusset it up to take the extra weight and it doesn't stretch as it's made of fiberglass. The shiny stuff on the pallet fork is FOSR or Flexible Optical Surface Reflectant, a material used to cover spacecraft radiators so they dump heat well. The plastic on the surface is very close to Teflon in nature. It keeps regular time; I think this week it only lost a couple minutes. It does change with the weather though. It stops on occasion when things slip out of alignment and curiously enough, when the furnace shuts off after the first run in the morning. Sporkboy, NocturnalWatch and Second like this. So long as it compiles, spelling errors really aren't an issue, are they? Neat 1 day clock. I would imagine the timekeeping variability in a paper movement is even greater than an old wooden movement. Here's a nice wide-angle shot of my Waltham A-11 cockpit clock. Desktop was a bit cluttered so I tried an empty shelf. 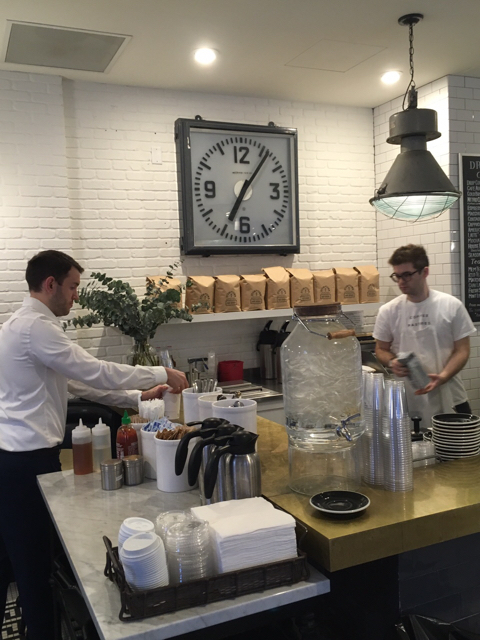 That coffee shop clock is pretty cool. It reminds me of railway platform clocks I've seen in Japan. Coffee shops and railways. My goal is to revisit Shinjuku Station. It's surprisingly good. Here in California we get nine months of dry weather and during that time, I rarely have to adjust the rate. In the wintertime I'm always making corrections. Of course, the minute hand gets nudged a bit from time to time. 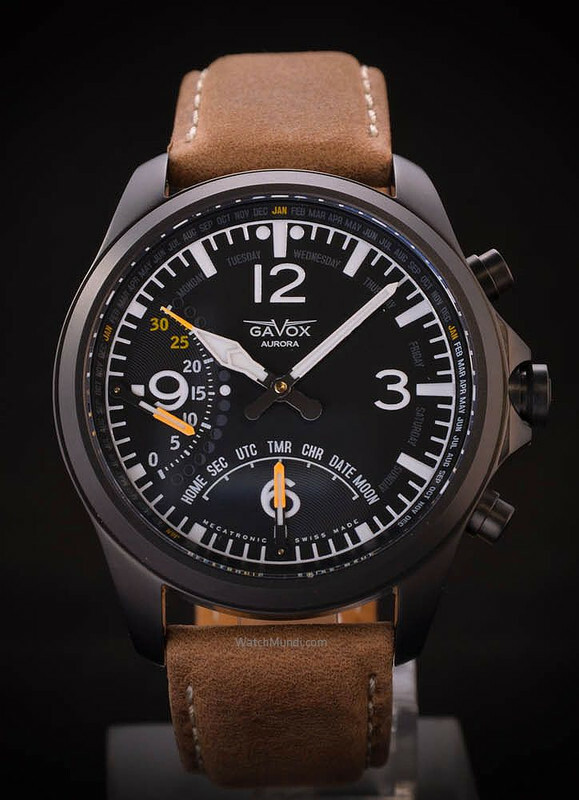 The lack of a dial makes it less of a bother. show us your desk/mantle/wall/grandfather clocks! 24 hour desk watches, wall clocks, alarm clocks or stopwatches anyone?